Permanent makeup, also known as micropigmentation or cosmetic tattooing, can eliminate the daily hassle of applying makeup. Permanent makeup is a form of tattooing in which pigment is implanted into the upper layer of the skin, and can be applied using a variety of tattoo methods, including a traditional tattoo or coil machine, rotary or pen machine, and by hand. Permanent lip, eye, and eyebrow makeup are the most common; however, cosmetic tattooing can also be used to redefine weak facial features and camouflage scars on any part of the body. 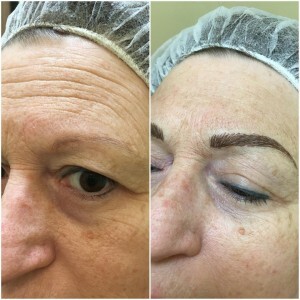 Although permanent cosmetics can fade over time and require periodic touch-ups, they are considered permanent because the color cannot be washed off. To produce the desired results, permanent makeup usually requires one or more touch-up procedures after initial application. For this reason, most technicians include the price of a touch-up procedure in the price of the application. Initial permanent makeup application typically takes one to two hours to complete, and touch-ups** take significantly less time. Permanent makeup can be applied to create the appearance of hair and is often used to define, shape, and fill in sparse areas of the eyebrows. 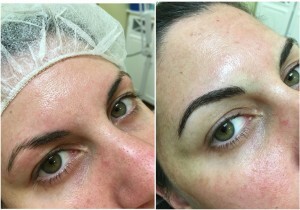 Permanent eyebrow makeup can also be used to create the look of a full pair of eyebrows for people who have lost all of their facial hair, often due to chemotherapy or other medical conditions. An experienced technician can produce the appearance of individual eyebrow hairs and create a natural look. 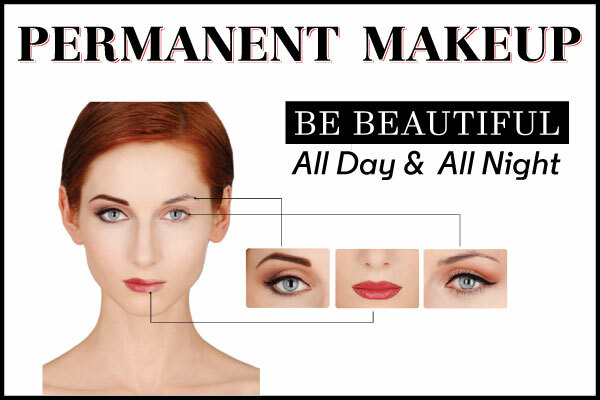 Permanent eye liner makeup can be applied in a variety of ways to help enhance the eyes. Permanent eye liner can be applied to line both the top and bottom lids, to create a soft look, a defined line, or anything in between. If you are tired of reapplying lipstick throughout the day, or you are dissatisfied with thin or crooked lips, permanent lip makeup can create fuller, more defined lips. You can pick a shade that matches your favorite lipstick, or a neutral shade for a natural look. Both permanent lip liner and lipstick can be applied in a variety of colors. If a more natural color is used, lipstick color can still be applied, and the permanent lip makeup will prevent color from bleeding. When a vivid shade is applied, all that is needed is a subtle lip gloss to enhance the lips. Permanent lip makeup can add fullness, balance crooked or uneven lips, and even minimize the appearance of wrinkles around the lips. However, caution should be taken when having permanent makeup applied to create fuller lips, as color that extends beyond the natural outer edge of the lips can create undesirable results. **First time clients receive free touch ups during the first 4-6 weeks.